We've got a passel of tools -- goodies designed to aMUSE the writer in you, or for gifting a friend! And specials for the holidays -- Check out when you click any of the links below. 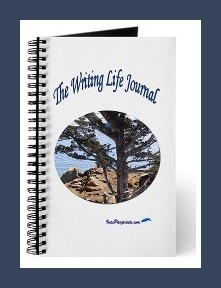 Jot thoughts, reveries, vexing and happy moments in this blank-paged journal. Click the photo to see who's lounging on the rocks to inspire you. 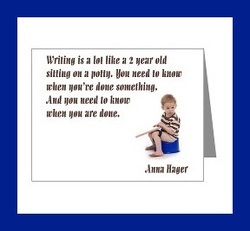 Mouseover The Writing Life mousepad anytime you feel you need a bit of input from your muse. We love Anna Hager, a wonderful, salty writer from the south whose characters retain their full flavor, including dialog phrased in the dialect she captures so well. Anna's Salty Sayings line in our store has several images you can select. This happens to be our fav -- from the Potty Boy series. Click the pic to get a bigger image so you can make it out. 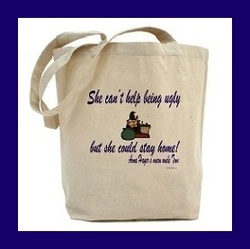 Anna's mean uncle's line, "She can't help being ugly, but she could stay home," has a raft of goodies, like this spacious and sturdy bag to carry all your writing supplies, even a laptop. You can find lots more of our goodies on our online store, including T-shirts, mugs, wall clocks and posters, and other goodies to wear or use as you and your writing muse create your memoir. Be sure to check it out to get special deals on inspiring gifts for your friends, or yourself!